Welcome to the Hasbro’s Funny or Die game Giveaway! You always see a lot of talk about Family Game Nights, and Krista who writes both Gloriously Green Gal and Savory Savings is a HUGE fan from those, however, what about the nights when the adults want to play and have fun? Maybe something slightly more entertaining and thought provoking than chasing an electronic monkey to throw rings on its tail (props to Chasin’ Cheeky – every time we have that game out the kids go CRAZY!). With that in mind, she was really excited to check out one of Hasbro’s newest additions to their 13 and older range of games, Funny or Die, a hysterical version of the video site in game form for your gaming pleasure! Be sure to check out her full review and the fun the grownups had having an adult game night while the kiddos watched a movie about unicorns. 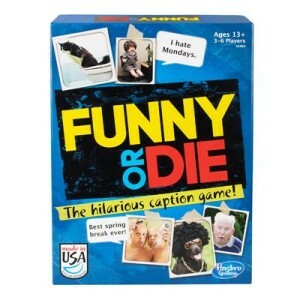 Would you like to win a copy of Hasbro’s Funny or Die and have an adult-friendly game night of your own? Enter with the Giveaway Tool below! This giveaway is open to US residents, ages 18 and older. The giveaway will run from December 29, 2013 through January 12, 2014 at 11 PM CST. Entries will be verified. Winner will be notified via email (consider adding gloriouslygreengal@gmail.com to your safe list) – winner will have 48 hours to respond and claim prize or another winner will be selected.